The Unstoppable "liquid gold" antiaging cream. Yes, this is the one from the Dr, Oz Show - "The Book of 40" - with updates. Our super-antioxidant base perfectly blends instant tightening with cumulative benefits. This wonderful all-over FACE cream works to smooth fine lines, wrinkles, crows feet and signs of stress while protecting your skin from damages. Excellent results can be found around the eyes, brow and mouth areas. *REMEMBER that neuro-peptides need time to build in your skin's muscles. As you use this product more and more you will begin to see big changes in the lines. Traditionally this will take about 30-45 days. It can give immediate results, but these are temporary. Use GABA Elite daily and see TRUE changes. Liftonin Xpress is an instant tightener, so those of you that want instant gratification can have healthy, uplifted skin. Loosen up - those tight frown lines. Our injection alternatives GABA and Syn-Ake work together to slow those muscle contractions and smooth out lines. Excellent for ALL skin types. Keep reading below for MORE great information about this special product. Not everyone likes to read long descriptions. So sit back, relax and listed to Platinum CEO teach you all about what makes our GABA Elite so special. Smooth expression lines with cumulative benefits. Excellent smoothing results can be found around the eyes, brow and mouth areas. A cooling sensation may be felt upon application, and then tightening will occur over a 1-10 minute time frame. An additional light layer may be applied to increase the effects. Use this cream 2X per day to allow the GABA to build in your skin tissues. SYN(R)-AKE is an excellent anti-wrinkle active compound with a snake venom-like mode of activity. 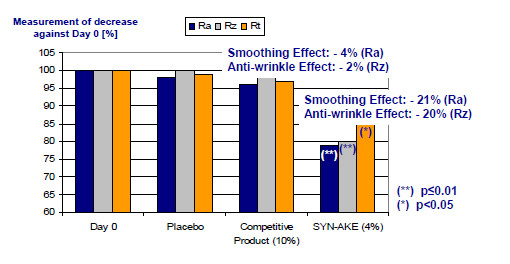 SYN(R)-AKE smoothes mimic wrinkles in a short period of time by building up in the skin tissues to slow muscle contractions. 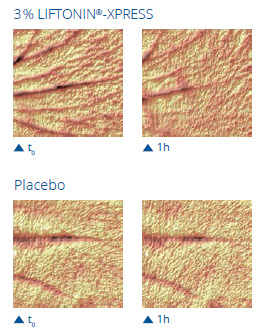 Age killing effect particularly effective against expression lines. Intensive anti-wrinkles care. Liftonin(R)-Xpress is based on renewable materials such as Cellulose derivatives and maltotriose polysaccharides. Embedded within it is a lyophilisate made from red micro algea. The physical tightening effect is intense, immediately noticeable and last for several hours. Various types of wrinkles are visibly and measurably minimized. Liftonin(R)-Xpress smoothes the area around the eyes by up to 74% within one hour! Hyaluronic acid (also known as a glycosaminoglycan) is often touted for its ability to "reverse" or stop aging. You may have heard of hyaluronic acid as the "key to the fountain of youth." This is because the substance occurs naturally in humans and animals, and is found in young skin, other tissues, and joint fluid. As you age, the daily bombardments of sun, smoke, UV rays... destroy the ample hyaluronic acid. Our formula will help to replenish what is broken down and lost. It will also help to boost your skin's moisture content - in any climate - since it works by "pulling" the water from your body, and not the surrounding air. Make sure to drink enough water daily to help keep it available! It is wonderful for dry skin, but can be used on ALL skin types! PEPHA(R)-PROTECT is a skin protective active containing naturally occurring vitamins, carbohydrates and amino acids such as citrulline. It is a highly purified Water Melon Extract which has its origin is the Kalahari Desert. Under extreme conditions Water Melon Plants developed their own defense system by producing Compatible Solutes against drought, heat and UV-irradiation. What Does It Do?It protects the skin against daily stress induced by UV-Light and free radicals. It reduces the fragmentation of DNA in human keratinocytes, and protects DNA from damage. Actigen(R)O2 (Panax Ginseng Root Extract) combines the Chinese healing secrets of Ginseng with Gynostemma to increase respiration and protect and nourish dry skin. In particular, increased blood flow results in an increase in the rate of oxygen being delivered to the skin, resulting in in-creased "respiration". This helps prevent or slow down the premature aging of skin and helps the skin from becoming dehydrated. Enhances delivery of nutrients. Facilitates removal of toxins. Reduces puffiness Alleviates bags under the eyes. <Lipogard(R) has a high content in ubiquinone 50 (coenzyme Q10) mixed with Vitamin E acetate, and is dissolved in plant-derived squalane. The ubiquinoneis part of the inner membrane of the mitochondria, the "power station of the cells"..
What Does It Do? It supports the natural defence mechanism against the damaging effects of free radicals (mega Antioxidant). Squalane is a penetration enhancer and moisturizer. Dr Oz did a segment called Anti-Aging Head To Toe: What To Do When It All Heads South. Dr Susan Evans demonstrated a wonderful eye tightening technique you can do in your own home (daily if you wish) by mixing OTC sinus medicine with GABA wrinkle cream. CLICK on picture (bottom) to go directly to his page and view the video.! Dr Oz did a segment called The Book of 40: Dr. Oz's Survival Guide to the Best Decade of Your Life. Dr. Elizabeth Tanzi M.D. gave our GABA Super Antioxidant as a recommendation to help lessen those fine lines! Use it alongside injections, or as an at-home alternative. Apply 1-2 pumps of complex to freshly cleansed skin each morning (face/eyes/neck). This product does not have any ingredients which interact negatively with other products. You can confidently mix this with your other favorites!